LHSimulations has announced the release date of Pécs-Pogány Airport (LHPP) version 2.0 for FSX and FS2004. KC Flight Shop has released the Republic RC-3 Seabee for FSX. Details and purchase at the KC FlightShop. - Authentic HQ digital stereo sounds. - Kneeboard checklist with performance tables. - Realistic night lights effect in the virtual cockpit..
- volumetric normal mapping, specular mapping and bloom lights. - Lights:Panel Lights, Navigation lights, landing and cabin lights. - Fully normal mapped interior. - Realistic behavior, pilot tested to match the real airplane. - Help from many pilot and owners of real Seabee’s for accuracy and authenticity. - 5 HD paint schemes. - 1 Republic RC-3 Seabee model (one male pilot). - 57 page Owners Manual. - Scanned original Pilots Check List. - 27 page Parts Catalog. Daniel Furnkas has posted new preview screenshots from the upcoming freeware Basler BT-67 for FSX. FSAddon has released Real Earth Dolomiti X - Pieve di Cadore for FSX. Details and purchase at the FSAddon Store. FranceVFR has released Rhone-Alpes PHOTO HD Vol.1 for FSX. More information at the FranceVFR Website. - 0.85 to 1 meter resolution ground texture made from aerial photography (IGN) retreated for an optimal visual rendition in FSX® (summer only). - Optional Waterclass and original water texture provided. - Process development is fully conform to the Microsoft FSX® SDK, ensuring a maximal compatibility with future versions of Flight Simulator. Jim Dhaenens has released the freeware Sheppard Air Force Base (KSPS) for FSX. Download at Flightsim.com. Kieran has posted new development renders from the Saab 2000 project for X-Plane 9 & X-Plane 10. Miami International Airport (KMIA) for X-Plane 9 & X-Plane 10 is now available to purchase at the X-Plane.org Store. The FlightGear version 2.6.0 RC1 for Windows is now available to download at the FlightGear Website. Khamsin Studio has posted another preview screenshot from the upcoming North American B-25 Mitchell for X-Plane. Orbx has updated the Lancair IV-P for FSX to version 1.3. Available to download at the Orbx Support Website. Orbx has updated the FTX Australia Traffic Pack for FSX to version 3.22. Download at the Orbx Website. - Australia’s newest Airline, Air Australia has been added using their latest schedules and brightly painted Airbus aircraft. - New Jetstar ‘Powderfinger’, ‘Quicksilver’ and ‘Telstra’ special liveries added. - Royal Brunei schedules updated. - Air New Zealand’s newest B777-300 (delivered Jan 2012) in All Blacks Livery added. - 3 of Air new Zealands subsidiary, Eagle Airways, B1900s in All Blacks Livery added. - Beechcraft 76 Duchess aircraft and repaints added. - Lots of new Cessna liveries including some of the more colourful Oxford Academy paints added. - The problem with a Green tinge visible on some aircraft when viewed from afar has been fixed. - Flight dynamics for the Piper Cherokee range updated to provide a smoother landing. - A number of other small anomolies fixed. Coolsky has posted an article on the failure simulation system in the upcoming Douglas DC-9 for FSX. 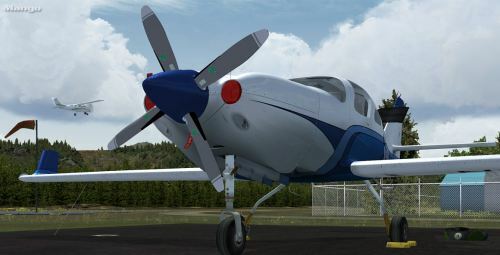 Ant's Airplanes has released the Tecnam P92 Eaglet for FSX. Details and purchase links at the product page. Aerosoft has posted more preview screenshots from the upcoming 'Full Version' of the Rockwell OV-10 Bronco for FSX. The German Airports Team has posted new preview pictures from Friedrichshafen Airport (EDNY) for FS2004. FSDG Djerba X (DTTJ) for FSX and FS2004 is now available to purchase at the Aerosoft Shop and SimMarket. VertigoStudios has posted more preview screenshots from the upcoming Boeing Stearman PT-17 for FSX. OZx has released the freeware Bellburn Airstrip 1.0 scenery for FSX. Details and download available here. SoulMade Simulations has posted the first in-sim screenshots from the de Havilland DHC-2 Beaver for X-Plane. DreamFoil Creations and Lidimar have announced development of the Aero Boero for X-Plane. Turbine Sound Studios has released the Boeing 707 Pratt & Whitney JT3D HD Sound Packages for FSX and FS2004. Ground Environment X (GEX) Africa and the Middle East for FSX is now also available to purchase at SimMarket. - Complete coverage of the Middle East and Africa from Pakistan to Cape Town. - Original HQ digital stereo sounds recorded from the original aircraft. - Polygon optimized model. Friendly FPS. - Eye candies (wheel chocks, pitot cover, sights prop and tiedown ropes). - Nightlight effects on panel and plane exterior. - Separate switches for instrument lights and dome light. - Toggle yoke at VC. - Realistic behavior compared to the real airplane. Accurately reproduced flight characteristics. - Realistic weight and balance. - Full moving parts: Ailerons, elevators, rudders, flaps, rolling wheels. - Animated sections such as: doors, sun visor and copilot seat. Blue Sky Scenery has released the freeware San Simeon, Santa Lucia Range photo scenery for FSX and FS2004. FS Flight Keeper for FSX and FS2004 has been updated to version 3.30. Available at the Product Page. Ben Supnik has posted an article concerning upcoming X-Plane 10 development on the X-Plane Developer Blog. The International X-Plane Engineering Group has posted this CATIIIA approach video from the Boeing 737-300 for X-Plane. Eagle Rotorcraft Simulations has posted more preview pictures from the upcoming Bell 222 for FSX. Aerowinx has posted this alpha video from the PSX Boeing 747 simulator currently under development. McPhat Studios has more preview screenshots from the upcoming ATR 72-500 for X-Plane. Dino Cattaneo has posted more information on the Lockheed Martin F-35A project currently under development. The developer of the upcoming Aerosoft Robin DR.400-140B for FSX has posted new preview screenshots. The freeware RIVA Super Ariston for X-Plane is now available to download at the XPFR Website.